An added bonus for any colour or treated hair for that extra vibrancy and protection. 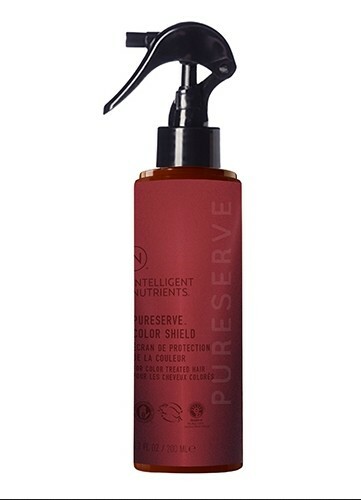 Create longevity for your hair colour and vitality with Intelligent Nutrients Pureserve Colour Shield. An organic and natural alternative to the harsh, unhealthy chemical sprays, use this lightweight conditioning spray on wet or dry hair for added shine. Protect you and the planet by using nothing but the best on your hair, it deserves it! Certified Organic Tilia is rich in phyto hormones, polysaccharides and proteins. This linden tree extract creates a protective barrier that blocks out daily damage and help seal in moisture. The lightweight multi-use enhances shine, locks in moisture and helps protect from environmental pollutants that can oxidize color and attack hair health and vitality. Use after shampoo as leave in treatment or on towel dried hair before styling. Enhances shine and colour vitality.